This 4 bedroom, 3 bathroom villa with private pool is well located in the sought after resort of Gale with a choice of picturesque beaches, shops and restaurants all within easy reach on foot. On top of this, the neighbouring resort of Albufeira is only a few minutes' drive away, and with its marina, shops and restaurants, it is well worth a visit. WiFi, pool heating and air conditioning/heating in the bedrooms and lounge are included. Spend a few hours by your pool then take a short walk to the beaches, shops and restaurants of Gale. Great location! The private pool is surrounded by ample terrace space to relax with a cool drink and soak up the warm Algarvean sun. There is a brick BBQ to one side of the pool, which coupled with the dining table and chairs is the ideal combination for dining alfresco. Villa Fatima has a lawned area to the side and front of the property. Although car hire is not essential there is a private driveway with space for 2 cars if required. The front door opens into a spacious hallway. The open plan lounge/dining area is comfortably furnished and has a feature fireplace, as well as patio doors opening onto the pool terrace. The fully equipped kitchen is on the right of the entrance hallway and has a table with chairs where you can sit and enjoy your morning coffee. There is also a door leading directly out onto the driveway. On the ground floor there is 1 twin bedroom and a separate bathroom adjacent. At the top of the stairs, on the first floor, there is a small balcony which overlooks the front of the villa. There are 2 twin bedrooms sharing a separate bathroom as well as 1 double bedroom with an en suite bathroom. This bedroom has patio doors leading out onto a balcony overlooking the pool below. All bathrooms have a bath and shower overhead. This villa has applied for a licence and the submission number is ALOC 226/2008. The licence number will follow. This delightful villa boasts a great position close to the beautiful Lourenco Beach, with the abundance of shops and restaurants at Gale all within easy reach on foot. Gale's beach is a little further with the popular neighbouring resort of Albufeira a few minutes away by car. This impressive 4 bedrooms villa enjoys a great location in the popular resort of Gale. There are 2 fantastic beaches and a choice of shops and restaurants within easy reach on foot, with the neighbouring town of Albufeira a few minutes away by car. Several other lovely beaches are located along this stretch of coast, such as those at Coelha, Sao Rafael and Praia Grande, all with snack bars or restaurants, ideal for those lazy days soaking up the sun. Albufeira, the Algarve's most popular holiday resort, to the east, boasts an expansive sandy beach and all manner of shopping amenities and restaurants. A mile and half further is Praia D'Oura with its thriving nightlife scene. Guia, the traditionl home of spicy chicken piri-piri, is around 4 miles inland and Zoomarine, a family attraction park is just a further mile from there. Ten minutes drive to the west is Armacao de Pera, a quieter resort, which also boasts an impressive beach. Further afield, particularly to keep children occupied are a choice of waterparks within a 25 minute drive of this villa. If you like to relax with a game of golf , Salgados golf course, with its lovely sea views, is 1½ miles to the west of Villa Fatima. Alternatively, the 9-hole Sheraton Pine Cliffs course is to the other side of Albufeira, near Olhos D'Agua. This private villa is in an ideal location for a family villa holiday, and for those seeking a blend of daytime relaxation and night-time entertainment. For those wishing to explore the Algarve more widely almost anywhere across the Algarve can be reached in little over an hour by car. Villa Fatima is not available to book for season as it is sold out. 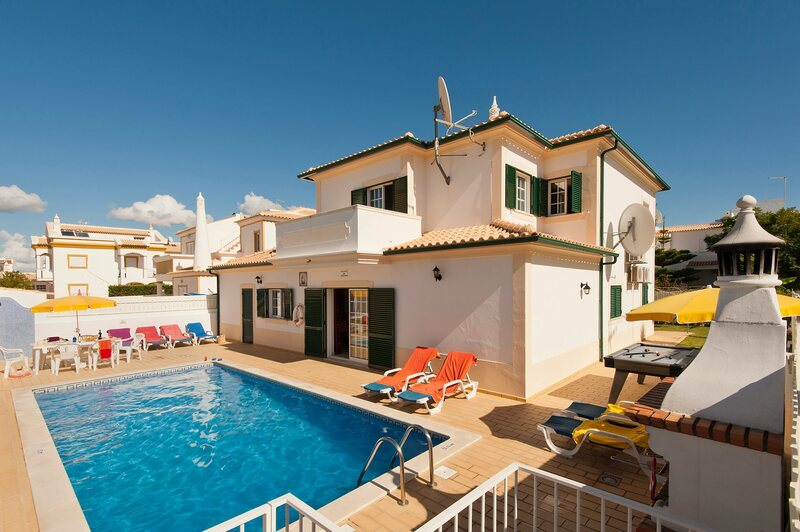 Take a look here at the Algarve villas that are currently on sale. The park includes a massive wave pool, superb water slides and mini golf. Also on site are a gift shop, changing and shower facilities, several restaurants, sunbeds and all you need to spend a really complete day of amusement. Located in its own beautifully landscaped gardens between Barao de S. Joao and Bensafrim, Lagos Zoo has a 60m flight tunnel for the observation of exotic birds. In here you can also find the monkeys' island and children have the opportunity of close contact with a variety of domestic and farm animals. The zoo also has a souvenir shop and a restaurant offers meals and snacks. Villa Fatima was very clean on arrival and had everything that we needed. It was located close to the beach and supermarket. It was very well laid out and had a lovely homely feel. A perfect villa for our first family holiday abroad. Clean, with plenty of space, all the facilities we needed and more in a great location for the beach and getting around. Everything was excellent, can't wait to book another Villa Plus . Thanks. EXCELLENT VILLA, WELL EQUIPPED WITH HOME TO HOME ITEMS, EVEN THE CUPBOARD UNDER BBQ WAS EQUIPPED WITH TOOLS & CLEANING MATERIALS! BEEN USING VILLA PLUS FOR MANY YEARS AND WILL CONTINUE, HAVE ALSO RECCOMMENED TO FRIENDS. Another fantastic holiday with Villa Plus. The Villa was immaculate. Excellent location close to Apolonia Supermarket and Galle Beach. No car required. Excellent facilities. Good restaurants close by.